Indian Coast Guard Recruitment department is inviting all Indian candidates to join Indian coast guard as an assistant commandant is general duty. All Indian candidates who have completed their Graduation degree in any stream are eligible to apply for these Government jobs in India. More information about these Government jobs is given below in this post, read the whole post carefully before applying. Graduation degree holder in any Science stream from any recognized university with minimum of 60% marks overall. Candidates must have Mathematics and Physics as subjects up to 12th class and in Graduation. Those who passed 12th class examination with Physics and math with 60% marks. Must Hold current / valid Commercial Pilot License (CPL) issued/ validated by (DGCA). Candidates who want to apply for this Indian Coast Guard recruitment for Assistant Commandant 2018 need not to pay anything. Candidates can apply for FREE For these Government jobs in India 2018. 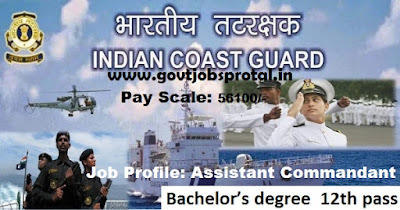 What is the Process to apply Indian Coast Guard Recruitment? Those who satisfied all the eligibility criteria for these Government jobs in India can apply online through the official website of Indian Coast Guard department. The process for applying online for this Indian coast Guard recruitment for Assistant Commandant will start’s on 19th May 2018 and will end on 1st June 2018. What is the Selection Process for this Indian Coast Guard Recruitment? There will be the written examination known as Preliminary Exam after that Personality test will take place for final selection of the candidates. 19th May 2018 is the Start Date for applying online. 01 June 2018 is the Last date to apply.